Electricity of Viet Nam has started conducting live-line or live wire maintenance to improve its operational efficiency. However, the tools and equipment it was using were not suitable to local conditions. Photo credit: Sumitomo Corporation. Japanese firms share best practices and technology in live wire maintenance with Electricity of Viet Nam to improve electric power distribution. Maintenance work is the main cause of frequent blackouts in Viet Nam. State-owned Electricity of Viet Nam Group (EVN), the largest power company in the country, is shifting to live-line maintenance to increase its operational efficiency and reduce service interruptions. The Japan International Cooperation Agency (JICA) facilitated knowledge sharing with Japanese companies Sumitomo Corporation, Aichi Corporation, and Kinden Corporation, which have years of experience in developing electric power systems, to enhance EVN’s ability to conduct safe and efficient maintenance work. The companies conducted a baseline survey of EVN’s maintenance operations. They organized workshops on mechanized maintenance of electric distribution, especially on the “hot line” method, and site visits for selected EVN engineers in Japan. Viet Nam wants to improve the efficiency of electric power distribution, which is key to its economic development. Frequent blackouts affect not only electricity users but also the profitability of the electric power company and impact the whole economy. According to EVN, 80% of blackouts were caused by their maintenance work. EVN tried to increase its operational efficiency by conducting live-line, also known as “live wire,” maintenance using machinery that they had acquired. Shifting to this method meant that it could do maintenance work without shutting down any segment of the power grid. However, EVN had problems using the new equipment as it was not that suitable to local conditions and because of lack of training. Accidents were a serious concern. The JICA-supported program, which was adopted in March 2015 and completed in May 2016, examined the situation at EVN and identified the areas of improvement. The baseline survey found that the elevating work platform that lifts the linemen up from the ground to the power lines for maintenance was higher than it needed to be and too big for narrow roads, which is common in Asian countries. The protective equipment used was too heavy for linemen and the protective gear, such as gloves, also did not fit them properly. 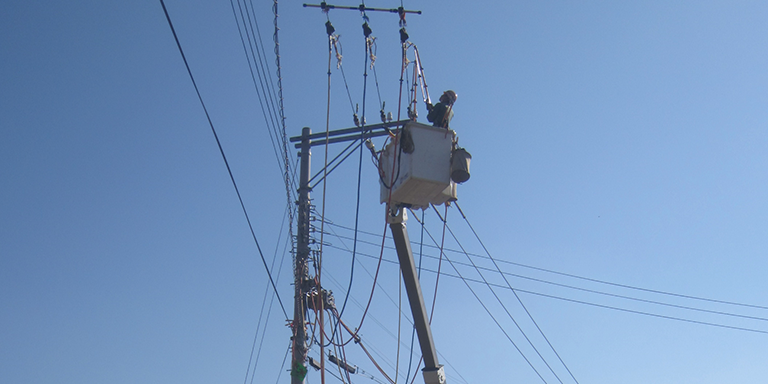 Linemen needed to be well-trained in hot line maintenance, since this involves working with high-voltage live wires. The elevating work platform was higher than it needed to be and too big for narrow roads. Protective gear, such as gloves, did not fit the linemen properly. Photo credit: Sumitomo Corporation. The program recommended maintenance methods, tools, and equipment that were more suitable to Asian conditions. A training program was developed based on Japanese companies’ experience and technology in ensuring safety and efficiency of maintenance work, particularly in small and narrow job sites. Eighteen engineers from nine subsidiaries of the EVN group were invited to join the workshops in Japan. They visited the Aichi factory for instruction and demonstration of aerial work platform and equipment. They also went to the Awaji office of Kinden’s Kobe branch, where they were introduced to the electric distribution workflow and given an opportunity to inspect the hot line job site. At the technician training institute Kinden Gakuen, the engineers were introduced to the training system and qualification scheme for power technicians. Back in Viet Nam, knowledge shared through the program was used by some EVN subsidiaries to create safety management rules. The program also resulted in increased collaboration with Japanese companies and business opportunities. The automated distribution system by Hitachi Group’s THE Power Grid Solution, which was introduced in the program, was adopted by Hanoi Power Company under another JICA program in 2015. Japan International Cooperation Agency (JICA). Program for Disseminating Safe and Efficient Mechanical Electric Power Distribution Work, Including Hot Line Method in Viet Nam. In Japanese. JICA. Overview of Project. In Japanese. JICA. 2016. Program for Disseminating Safe and Efficient Mechanical Electric Power Distribution Work, Including Hot Line Method in Viet Nam. Project Completion Report.